we will see in Section 1.8.
called the denominator. Division by zero is not allowed, so b ≠ 0 or the result is undefined. the resulting expression is an equivalent fraction that has the same numerical value. must always be left in the “simplest form”. 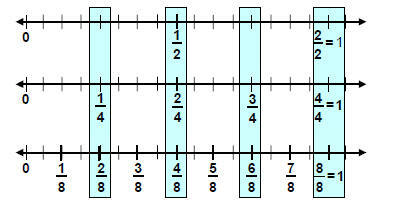 -> Fractions can also be written as decimals if they are terminating or repeating. In algebra we write fractions with a larger numerator than denominator in improper form. English words Math symbols . numbers and perform resulting operation. Do not drop absolute value symbols here. number and perform resulting operation. do not “drop” them without replacing the resulting number with an unsigned number. containing fraction expressions must always be left in the “simplest form”. Leave answer as improper fraction. Raise (power) both the numerator and denominator.